During the 125th/126th Sessions of the WCO Council, which took place in June of this year, Heads of Customs administrations representing the 180 Members of the WCO conferred on many issues, including but not limited to, trade facilitation technical assistance and capacity building under the WCO Mercator Programme, e-commerce, and security, especially the adoption of a third pillar to the WCO SAFE Framework of Standards to Secure and Facilitate Global Trade (SAFE Framework) on its 10th anniversary. In this article, I take up each of these topics in turn. The WCO Mercator Programme, which assists WCO Members in implementing the World Trade Organization’s (WTO) Trade Facilitation Agreement (TFA) in a harmonized way by using WCO tools, continues to make steady progress. Mercator consists of two tracks: (i) awareness-raising and promotion of WCO tools through regional and national workshops; and (ii) tailor-made assistance. Three WCO regional workshops were organized in the first half of this year to raise awareness of WCO tools that support trade facilitation: in Jakarta, Indonesia for the Asia/Pacific region; in Budapest, Hungary for the Europe region; and in Manama, Bahrain for the North of Africa, Near and Middle East (MENA) region. It is noteworthy that two of the three workshops were co-sponsored by regional development banks, namely the Asian Development Bank and the Islamic Development Bank, enabling Ministries of Trade and other Ministries to participate and dialogue with Customs, and recognize the important role of Customs in implementing the TFA. The remaining three WCO regional workshops are scheduled for the second half of this year. The tailor-made assistance track delivers needs assessment, technical assistance, capacity building, training, and monitoring. The WCO has already delivered more than 70 national and regional missions under the Mercator Programme. In this respect, I am particularly grateful to the countries that have provided donor support as well as Customs experts for Mercator missions. The Internet is witnessing a rapid expansion in the sale of goods and services due to faster transmission speeds and more secure means of payment. E-commerce is expected to continue to grow exponentially in the future with double-digit growth, and will be a key driver of economic growth, particularly in providing an easily accessible wider platform to Micro, Small and Medium-Sized Enterprises (MSMEs) engaged in cross-border trade. This channel of trade is opening up opportunities for individuals to bypass more traditional ways of doing business, potentially eliminating intermediaries, such as wholesalers or local retailers. It is, therefore, necessary for Customs and tax authorities to understand fully how the new environment will develop, both technically and organizationally. Taxation systems currently structured around traditional business models will need changes to adapt the existing systems and procedures in order to effectively prevent loss of revenue and, at the same time, to ensure that there is no discrimination between businesses using the new technology as opposed to those continuing to trade conventionally. Many WCO Members have seen a significant and rapid growth in the volume of low-value imports of physical goods on which duties and taxes are not collected. Additionally, this growing commerce mechanism is posing challenges to Customs enforcement, such as the sale of drugs, counterfeit and pirated goods, the illicit trade in wildlife, weapons and explosives, and the smuggling of restricted and/or prohibited goods, including high-value excisable items. Noting Customs administrations’ concern on revenue leakage from low-value consignments, including shipments below an exempted threshold, which also had a distortionary impact on domestic manufacturers and retailers, the WCO has been analysing various working experiences and models, including the challenges and potential solutions, relating to the efficient collection of revenue on imports of low-value e-commerce, such as de minimis and vendor collection regimes. The WCO and its Members are thus taking its work on e-commerce forward, including advancing work with other relevant international organizations, such as the Organisation for Economic Co-operation and Development (OECD) and the Universal Postal Union (UPU). Customs plays a vital security role, including countering terrorism and violent extremism. In June, on the 10th anniversary of the SAFE Framework, the WCO adopted a third pillar on Customs-to-Other Government and Inter-Government Agencies for its SAFE Framework. This pillar joins the other two, namely Pillar 1 (Customs-to-Customs) and Pillar 2 (Customs-to-Business). Recognizing the importance of cooperation between Customs and other government agencies involved in the international trade supply chain, Pillar 3 aims to foster closer cooperation between and among them, ensuring an efficient and effective government response to the challenges of supply chain security, whilst facilitating legitimate trade. Pillar 3 foresees cooperation at three levels: cooperation within the government; cooperation between and among governments; and multinational cooperation. Standards for each of these areas of cooperation have been developed to promote a multi-tiered approach. In this regard, the WCO has already developed a number of tools that support this new pillar, notably the Compendiums on Coordinated Border Management and the Single Window, which are ‘living’ documents being continually updated. In addition, standards for ‘Pre-loading Advance Cargo Information’ in respect of air cargo have been incorporated, enabling a first layer of security risk analysis to be carried out together with civil aviation authorities. Due to heightened global security concerns and the adoption of the United Nations’ global Arms Trade Treaty (ATT), the WCO launched the Small Arms and Light-Weapons (SALW) Project to address the challenges faced by Customs in dealing with weapons of this nature. In addition, the relevance of the use of Advance Passenger Information (API) and Passenger Name Record (PNR) information to target both contraband and high-risk individuals were specifically underlined by the WCO Council as needing further emphasis. The WCO will continue to confer and act on the top emerging issues facing the global Customs community, of which I have highlighted only a few in this article. 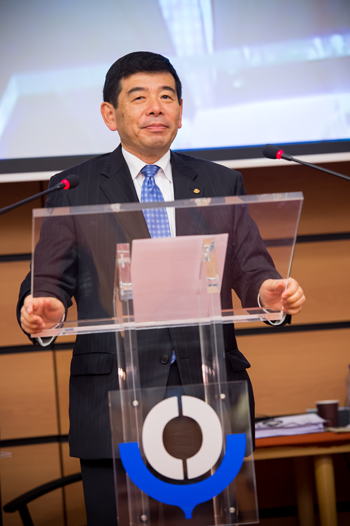 Additional WCO activities are summarized in the articles which follow, under the name of each WCO Directorate, including other interesting highlights from the 2015 WCO Council sessions. In fact, I can quite admirably state that this year’s Council sessions were dynamic and positive, charting a clear path forward for WCO Members and the international Customs fraternity as a whole.